Raise your hands if you think that Bobby Flay is king of BBQ and burgers! With no hesitation, my hands are above my head!!! All these Bobby Flay BBQ chicken recipes at here, here, here and here and his burger recipes at here, here and also his most ultimate burger recipe featured in the Food Network magazine, September 2014 issue are all that I have bookmarked... but didn't eventually cook them because they are either too hot and spicy or too complicated with a long list of ingredients! This is so Bobby Flay! Always so mah fan (Mandarin language meaning bothersome) and super complicated!!! For instance, I like to cook one of his BBQ chicken recipe which contain his famous sixteen-spice rub but can't do it because it requires a few particular kinds of chile powder that is not commonly found in our supermarket! Well, I could have made Bobby Flay's sixteen-spice rub into twelve or thirteen-spice rub... LOL! but I didn't. I believe that the presence of all these sixteen spices in this recipe is pretty essential. Is food made with complicated method really so delicious? I have to say that... After tasting these chicken wings baked with Bobby Flay's inspired Asian-style Pineapple-Ginger BBQ sauce, I have to give Bobby Flay's complicated way of cooking the benefit of doubt as these wings are really really really good. Originally, this BBQ sauce recipe from Food Network is used to grill ribs which will take more than 4-5 hours. 4-5 hours!!!??? There is a long preparation step required to make the BBQ sauce and the ribs has to be cooked for more than 2 hours until tender! 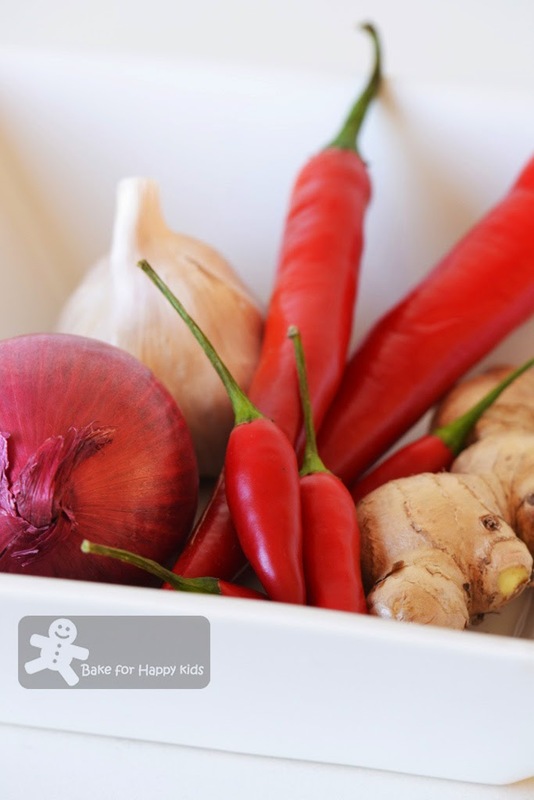 The beautiful Asian ingredients that I have used to make the BBQ sauce. 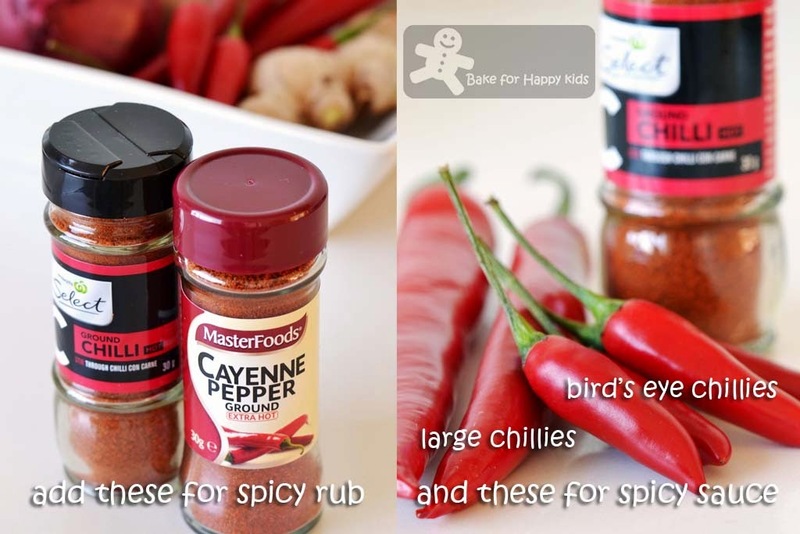 I have added these to make the spicy wings. 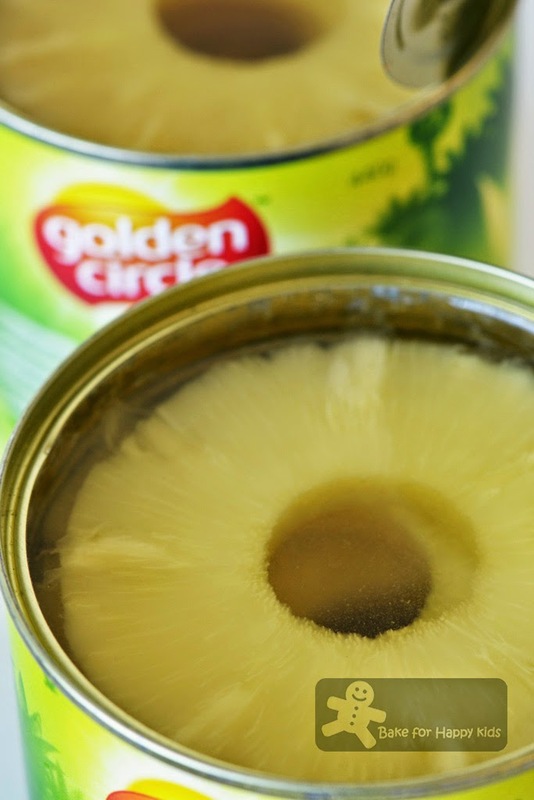 For convenience, I'm using can pineapples instead of the fresh ones. To cook the sauce, I have caramelized the ginger, onion, garlic and pineapple first. Finally... These are the sauces! Using the oven, I'm baking these wings. The baking takes me about an hour. Serve them with roasted sesame seeds and finely chopped spring onions. Man: This sauce is superb. Boy can't talk. Too busy eating. Mum: This recipe is originally used to cook ribs. Man: Oh! This sauce must be very delicious with ribs! Please cook this again with ribs! Mum had fainted due to exhaustion!!! 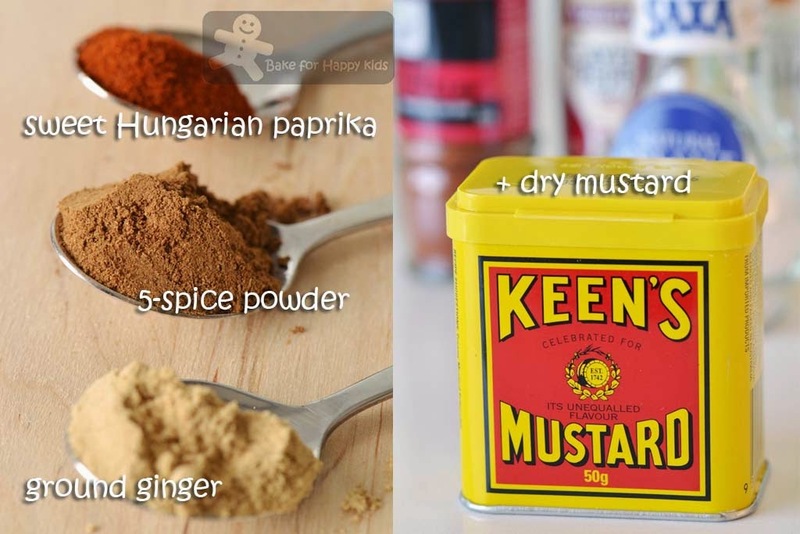 For the wings: Stir together the paprika, dry mustard, ground ginger, ground star anise plus all spice / 5-spice powder, salt, pepper and chili powder (optional) in a bowl. 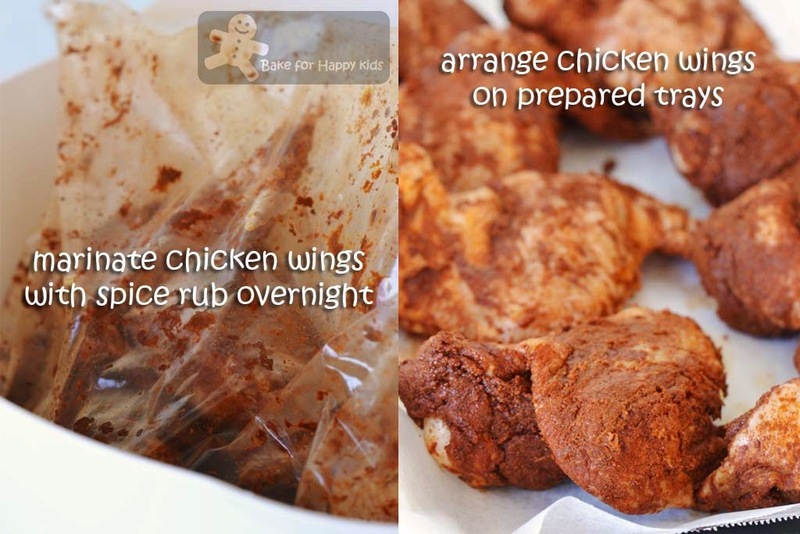 Rub the chicken wings with the spice mix, wrap in plastic wrap and refrigerate for at least 4 hrs and up to 24 hrs. For the sauce: Heat the oil over medium-high heat in a heavy-bottomed medium saucepan. Add the garlic, ginger and onions and cook until soft, about 5 mins. 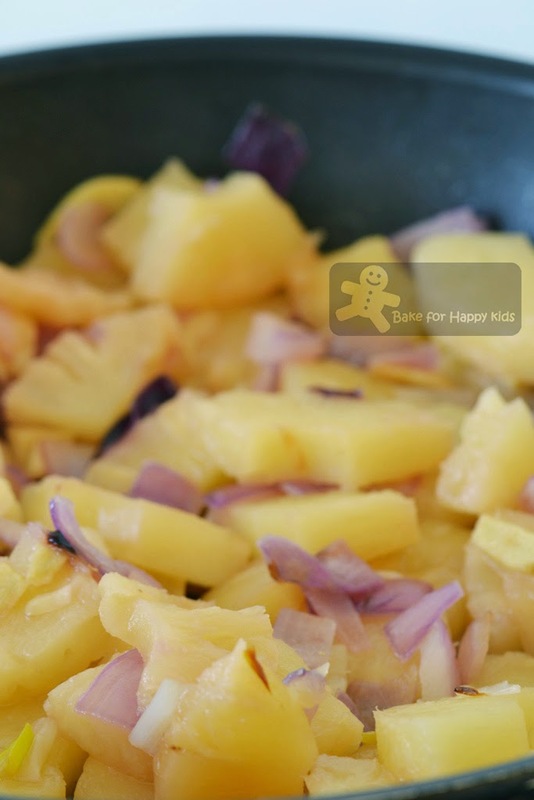 Add the pineapple chunks and cook until it caramelizes slightly, about 3 mins. Add pineapple juice, cook hoisin, ketchup, brown sugar, mustard, honey, soy sauce, ground star anise / 5-spice powder and cinnamon and cook until thickened, about 30 mins. Transfer the mixture to a blender and blend until smooth. 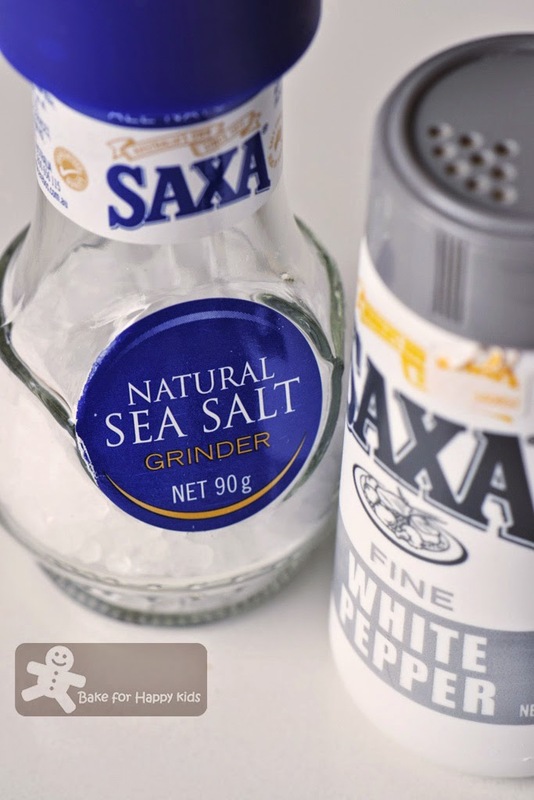 Season with salt and pepper . Pour into a bowl and allow to cool to room temperature. 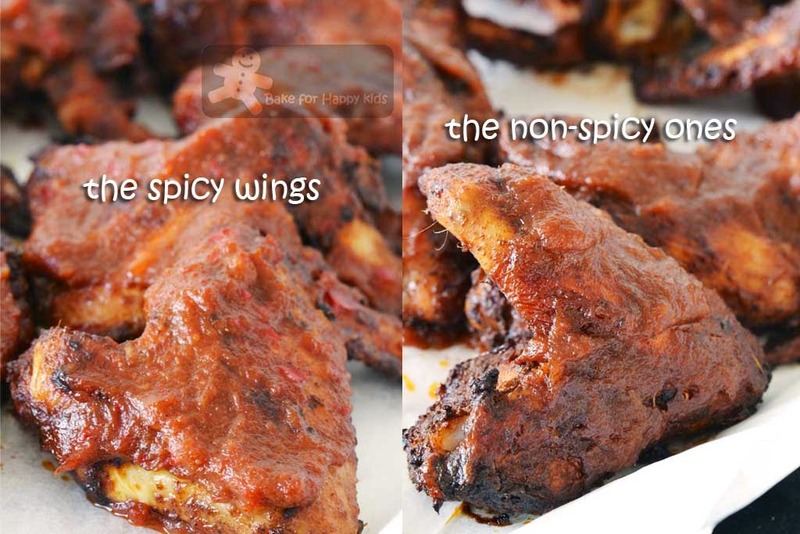 Remove the chicken wings from the fridge about an hour before baking. Preheat oven to 220°C or 200°C fan forced. Place chicken wings on two roasting trays lined with non-stick baking paper and baked them for 15 mins on each side (plus switching the position of the trays) or until starting to brown (about 30 mins). Lower oven temperature to 180°C or 160°C fan forced. 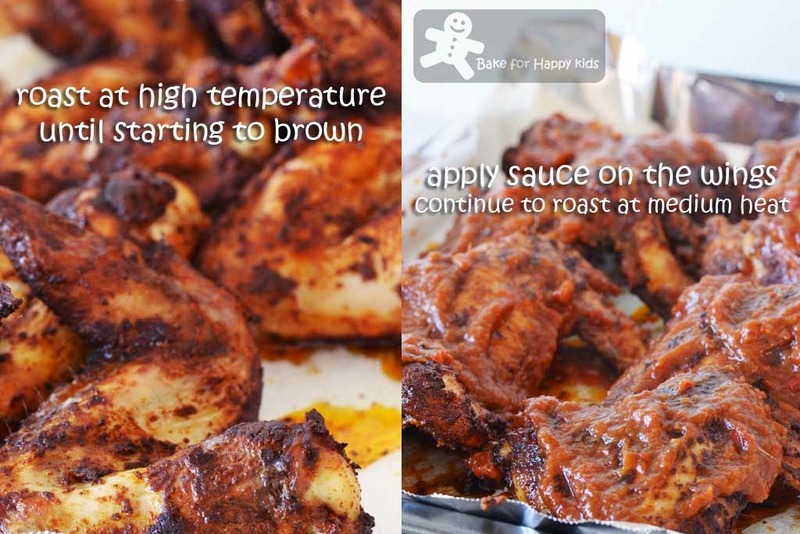 Remove the chicken from the oven and coat the chicken with the pineapple BBQ sauce and return to the oven, basting occasionally for a further 15-20 mins. To finish, transfer chicken wings to fresh sheets of baking paper without any sauce. Return to bake the chicken wings with thin layer of a final baste at 160°C fan forced for 5 mins at each side until the wings turn golden brown and sticky. Served with roasted sesame seeds and finely chopped spring onions. Haha Zoe, I also had to give a lot of his recipes a miss cos I cant find the ingredients over here in KL. And cooking for 5 hrs is just not for lazy me. Wah, lots of work, and a lot of ingredients too, but they're all worth it when your man and boy love them! I wouldn't mind doing all the hard work and cook again if everyone loves it.. Mmm mmm, your chicken looks so delicious, I can finish all the 16 pieces of wings! I think 16 wings is not enuff for me, I can eat a whole chicken! You are really killing me as I scrolled down picture by picture.... these chicken wings sure to be finger lickin real goooood!!! Are all of you eating these wings with your fingers? Bravo, Zoe! 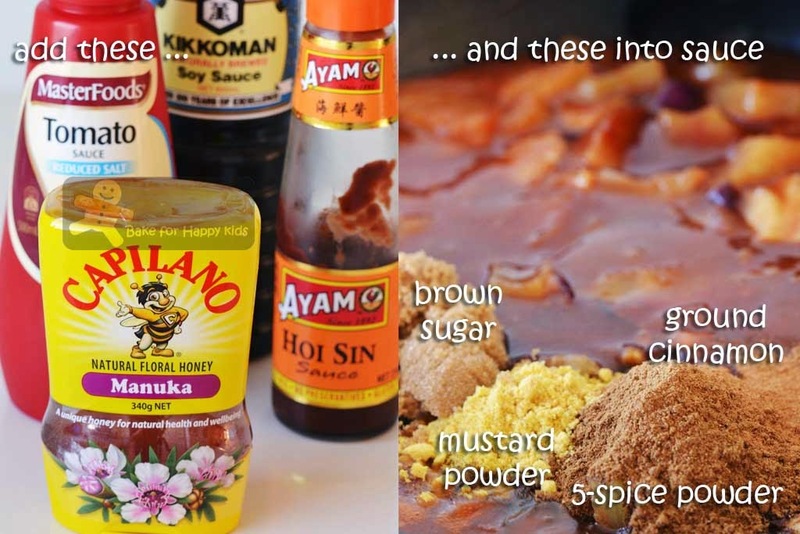 hah..hah..I also chanced upon this recipe and was quite intrigued. 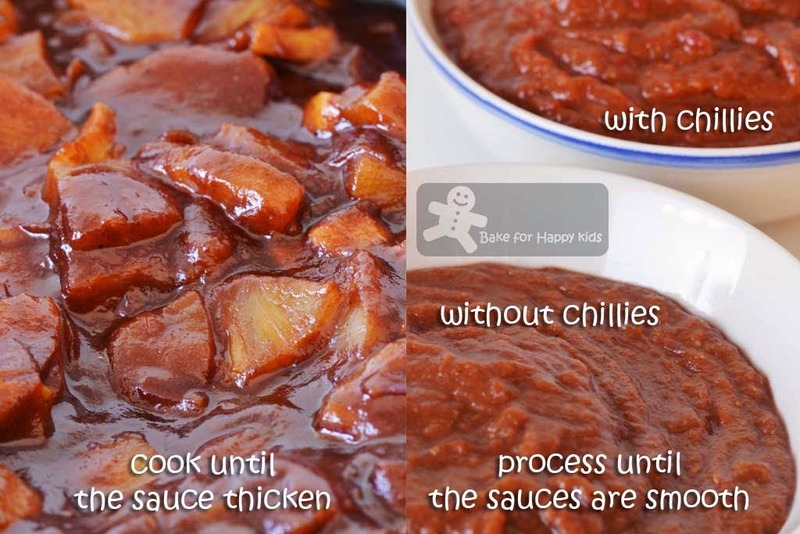 I was pretty sure the BBQ sauce is awesome but just reading the recipe made me tired LOL! Your chicken wings are really superb, I mean, how could they not be after all the hard work! As I was reading your post I was also thinking this would be good with ribs. YUM! This looks and sounds delicious! 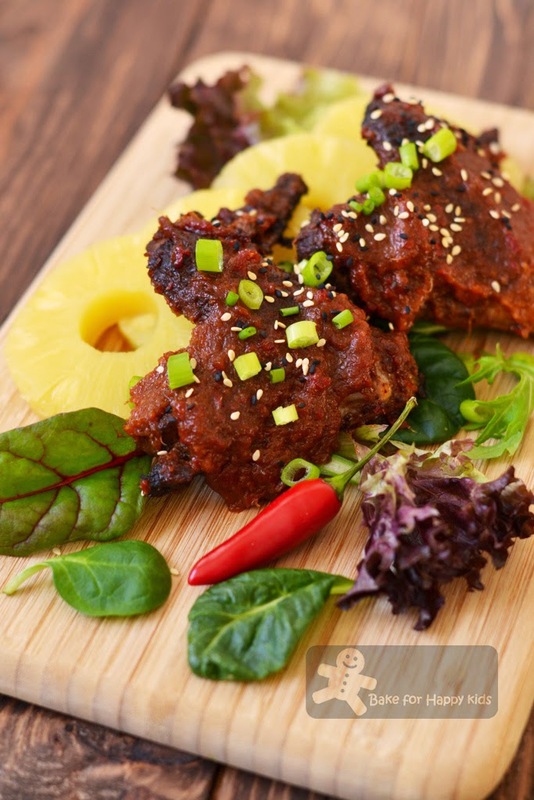 I love love pineapple and love sweet, sour, spicy, savoury flavors together! This must be sooo appetizing and yummy! I would be licking my fingers! Looks very delicious! Sweet and tangy flavor I love! Sounds like you had a great time in Japan. I'm super jealous! I miss Japan! Zoe, salute to you for able to make it for such long ingredients list, I already feel giddy for looking at it lol. so can treat me some chicken 1st to ease my craving lol. These are tempting grilled chicken wings. Sure looks finger licking good. Love your CLAS & celebrate Christmas badge. Delicious wings! 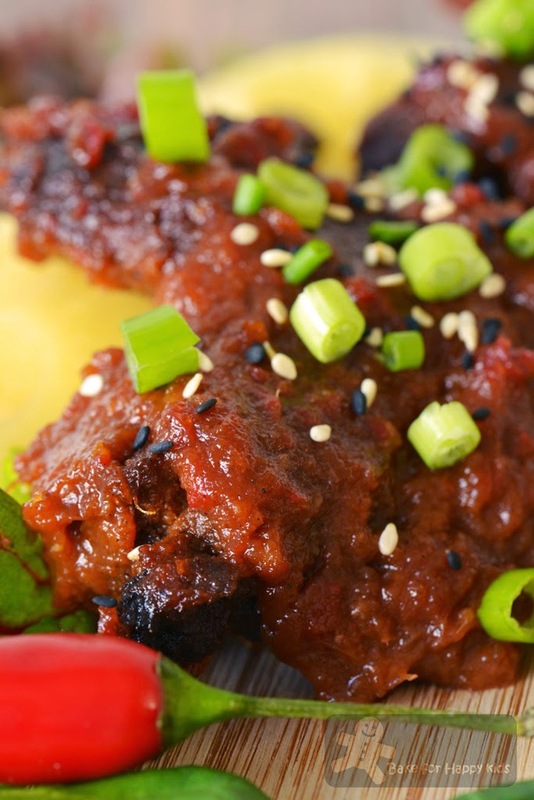 Your hubby is right, make this with ribs! haha! Yup, Bobby Flay's recipes are rather long, and he loves chilli! I could eat half a dozen of those wings, looks really delish! This looks delish and finger licking good!! Omigosh...this is something I have to, HAVE TO, try! Thanks, Zoe. I heart you. It's odd -- I've eaten at one of Bobby Flay's restaurants, and watched plenty of his TV shows. But I've never cooked one of his recipes! And I like what he does. Gotta get moving, and maybe start with this -- great dish. Thanks. Those chicken wings are calling out to me. This is amazing. I can't wait to make it for game day. Wow! This is so delicious and finger licking good! !